One of the most challenging aspects of grappling with mental illness is not just the negotiation of an emotionally fraught psychic territory, but the social pressure to conceal whatever struggles may be happening internally. For women, especially young women, this struggle is a subset of the prevailing demand to present a shiny, positive face to the world. 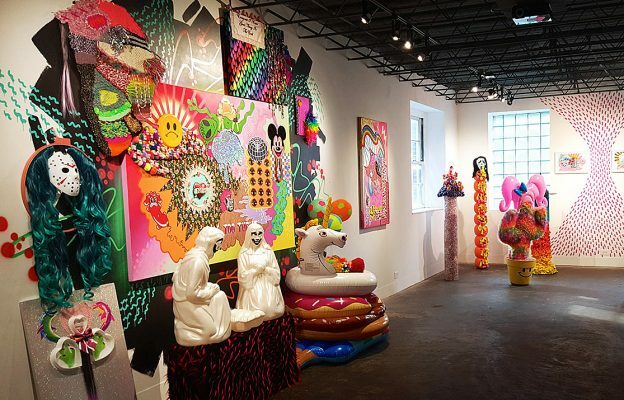 In Somewhere Over the Rainbow is a Double Rainbow, at HATCH Art in Hamtramck through May 28th, artist Shaina Kasztelan effectively reveals the turbulent and colorful interior life of a young Millennial woman. This, her first solo outing, is an installation-heavy environment that immediately draws the viewer into a kind of psychedelic and intensely female headspace, via a chaotic accumulation of material culture that targets her as a consumer. These materials include, but are not limited to: stickers, small toys, fake fur, plastics in innumerable iterations, decorative cake toppers, beads and cheap jewelry, a blow-mold nativity trio, fake fur, craft paper, artificial hair, and a series of pool floaties. Hearts! Rainbows! Unicorns! Kasztelan has plumbed the depths of the party-variety store in her search, and leaves no corner of her installation space unoccupied. One has a sense of stepping into a riot of Attention Deficit Disorder and teenage misanthropy, rife with cultural references that might be enigmatic to some, but readily identifiable to anyone within Kasztelan’s demographic. The nativity scene sports Insane Clown Posse face make-up; a cross-stitch bears an iconically self-pitying Nine Inch Nails lyrics; everywhere we encounter pop culture figures, from Mickey Mouse to the murderer from Scream, to the ubiquitous “Have A Nice Day” smiley face, in various interpretations. This is an interesting interplay between the objects Kasztelan has bought ready-made and incorporated into her texture- and color-rich compositions, and those that she assembles from scratch using craft materials; why bother to meticulously assemble a Mickey Mouse face from perler beads, when there are literally thousands of commercially made objects bearing the same visage? This speaks to a kind of obsession, which is echoed in the endless repetition of shapes—often small toys that can be bought in bulk for a few pennies each. In “Baby Cactus is Happy,” a cactus shape covered in rainbow hair and wearing a pink inflatable wig bears dozens of tiny variety store plastic babies, the mere existence of which is slightly confounding. Indeed, when you start to zero in on any of Kasztelan’s works, the preponderance of oddly useless objects generated by our culture and marketed in the direction of young women begins to become unnerving. What message does it send, to be continually surrounded by things that are colorful, basic, and functionless. 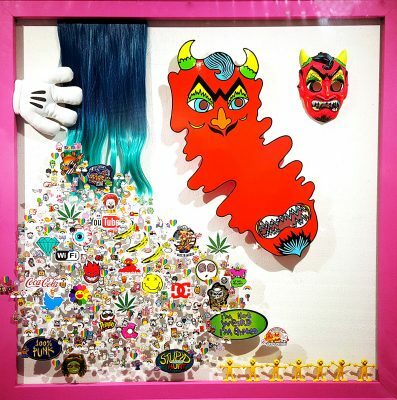 Kasztelan seems to have compensated for this material invasion of her head by creating an imaginary life for these objects, reimagining them into creatures, friends, and demons—golems of hyper-femininity—often by means of craft projects, another highly feminized activity set. As each creature takes shape, so it reflects some aspect of young womanhood, dark or light. “I Scream, You Scream, We All Throw Up,” is a tower of plastic spray foam, fused into a kind of totem pole with spray foam, and topped with a fright mask that is the most recognizable symbol from the “Scream” movie franchise. The mask is vomiting spray foam in lurid colors down the length of the totem pole, and this violent mixture of hoarding candy, binging, and purging, very successfully blurs the innocence of a child’s Halloween activity with the body image pressure applied to young girls as they emerge into puberty, and the resulting host of horrific eating disorders that are a scourge against this demographic. Though presented in the trappings of frivolous girlhood, Kasztelan’s materials are a Trojan Horse for extremely intense concepts about sexuality, drug use, and mental wellness. Technically, each piece is incredibly rich in detail, seamlessly constructed (even in the event that drippy spray foam is being used as an adhesive, there is an intentionality and conscious hand at work) and remarkably successful at balancing literally hundreds of objects into well-balanced compositions. As a first solo outing, Kasztelan’s work already presents a strong self-awareness and adroit leveraging of a personal perspective that is often marginalized—that of the young woman, struggling to process a world full of expectations and distractions, and perhaps prone, in this struggle, to medicate some of the confusion into imaginary friendships. Somewhere Over the Rainbow is a Double Rainbow is a wild journey that brings home a surprisingly deep message. 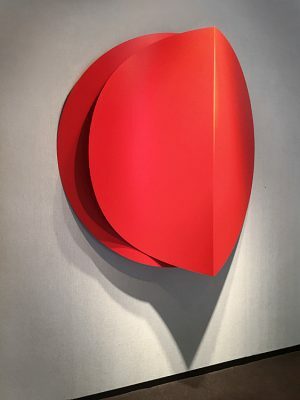 The Robert Kidd Gallery, in Birmingham, Michigan opened an exhibition of sculpture by the artist Lois Teicher on May 21, 2016. These hand-welded shapes of metal with spray painted surfaces rely heavily on her use of space and form. 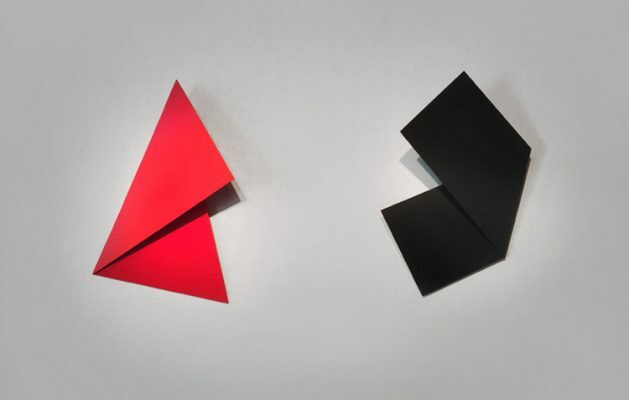 Working in a minimalist tradition, Teicher brings a high level of technical accomplishment to these abstract works. These sometimes folded pieces of colorful metal are hard-fought ideas that use pure geometric forms that give the viewer a certain type of comfort that is easy on the eyes. It brings to mind a piece of Teicher’s work outside in a lush organic and natural setting where there is an extreme contrast presented. 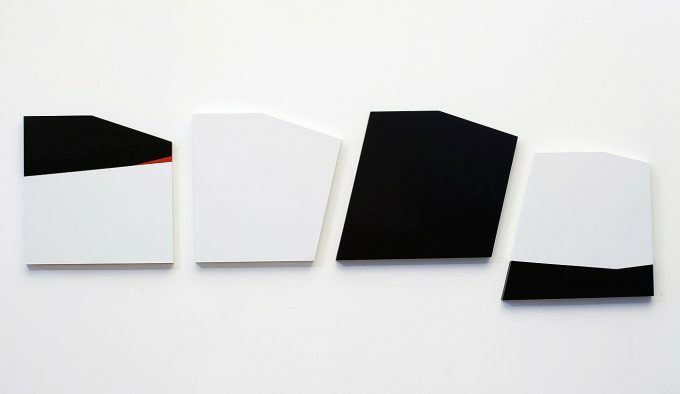 The conceptual idea presented in Teicher’s work reminds this writer of work by Robert Mangold and Ellsworth Kelly. Searching for the roots of the minimalist tradition in a broad sense, these geometric abstractions are easily associated with the Bauhaus School in the work of Yves Klein, Piet Mondrian, and Joseph Albers. Some might suggests the movement was a reaction to abstract expressionism, but I would argue it is more of an inner-sensibility that drives this work; that there is an internal intellectual idea that says these forms are part of what creates the space/time continuum in the universe. The work on the floor and the wall sings a similar minimalist note, but Ms. Teicher takes her own step when she makes the form fold. What needs to be said is the role scale plays in this work. Some of the work in this exhibition seems like scale models for larger work that would be placed in public spaces. Given the space afforded by galleries, it’s these models that often stand alone as works of art in search of a public space. There is a natural balance in Teicher’s pieces with a Zen-like simplicity that informs each piece of work with a high caliber of visual experience. “Realism gets a bad rap,” says Christine Schefman, Director of Contemporary Art for David Klein Gallery, and helmswoman of the new downtown Detroit location. The latest show to open at David Klein is Pictures of You, which features five painters, each of whom employs realism in some capacity in his renderings—and each of whom makes a pretty good case for its enduring relevance in a time where painting is no longer the leading technology for capturing reality. The show is divided between a focus on human versus architectural subjects—and within each subject type, further divided between attempts at photo-realism versus the taking of impressionistic liberties. Within the architectural realm, artist Stephen Magsig holds down the stricter side of realism, with austere landscapes that seem, for all their industrial details, to be fundamentally about capturing light where it strikes and fades from surfaces. 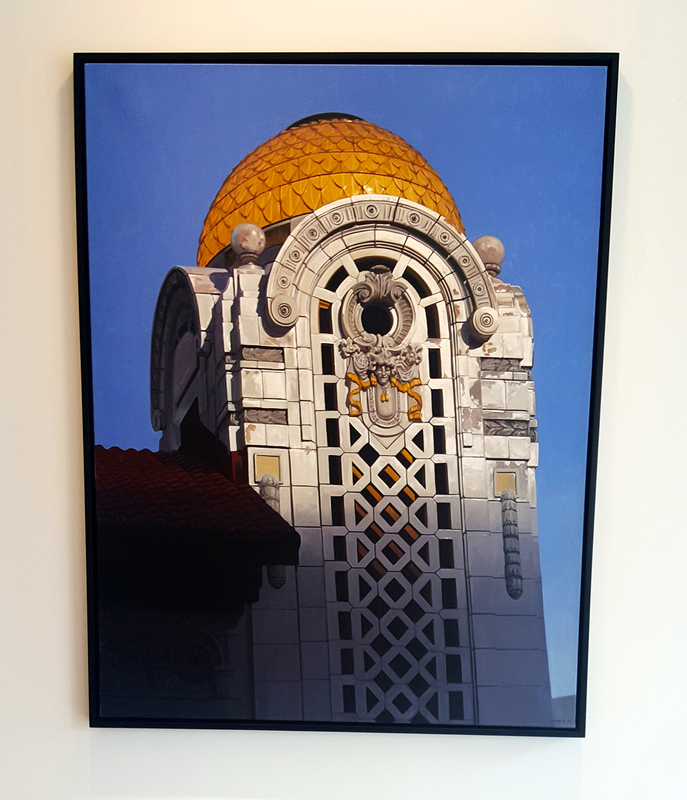 The works on display are larger than his exceedingly charming ongoing series, “Postcards from Detroit,” which capture this same basic subject matter at a handheld scale. While the postcard series is a bit looser, Magsig’s larger works are precise and focused—perfectly capturing, but perhaps more potentially outstanding when viewed outside the context of, the city from which he draws so much inspiration. Occupying the more impressionistic end of the architectural spectrum is Trevor Young, whose works on display include fuzzy nightscapes that evoke the dark, patchwork quilt-like city lighting grid from a bird’s-eye perspective, and nighttime tableaus of empty gas stations, their diffuse fluorescent lighting creating washes of quiet menace. These images, though outwardly stolid, nonetheless contain a kind of radiant energy; one can practically hear the buzz of lighting, the sharp intake of breath before some kind of hell breaks loose. Fighting on the side of humanity, Robert Schefman’s works seem to hew more closely to photo-realism, with a painter’s natural fetishism around capturing light sources and shadow, and perhaps a more personal kind of fetishism at play in a set of works dealing with characters and scenarios lifted from the “Clue” board game. Mrs. Green, kissed by afternoon light, gazes pensively out a window; Mr. Green is crumpled mostly out of the frame at her feet, amid a tangle of rope (he appears in a separate canvas). 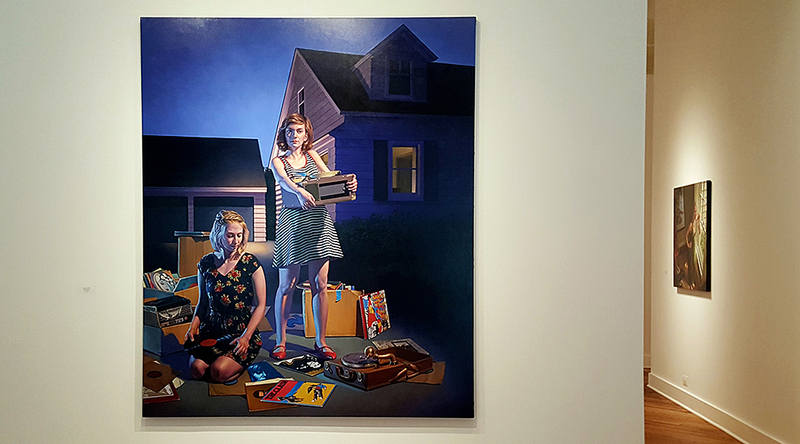 The eye-grabbing large-scale work that hangs at main gallery center depicts two young women in the process of sorting through boxes of records at what seems to be a twilight listening party in a driveway. Though his narratives are somewhat dreamy or disturbing, the details are sharp; by contrast, the large-scale oils on linen by Jamie Adams seem torn from vivid fantasy. Evoking classic mythical painting, but with updated clothing, and luridly modern colors, Adams’ subjects stand apart from a readily identifiable location in reality. They seem like Greek gods, engaged in floating orgies, adrift in carnal encounters, highly figurative, but like nothing of this world. Bridging all of these works are the poignant and beautiful contributions by Detroit painter Andrew Krieger . Though clearly figurative, Krieger’s works evoke a kind of non-idealized nostalgia—more Richard Linklater than Norman Rockwell. The movement and depth created in his images—which feel unmistakably specific, seemingly torn from the raw source of memory—is enhanced by his architectural canvases. Unable to be confined to a flat picture plane, Krieger’s images literally buck, curve, and protrude into three-dimensional space. 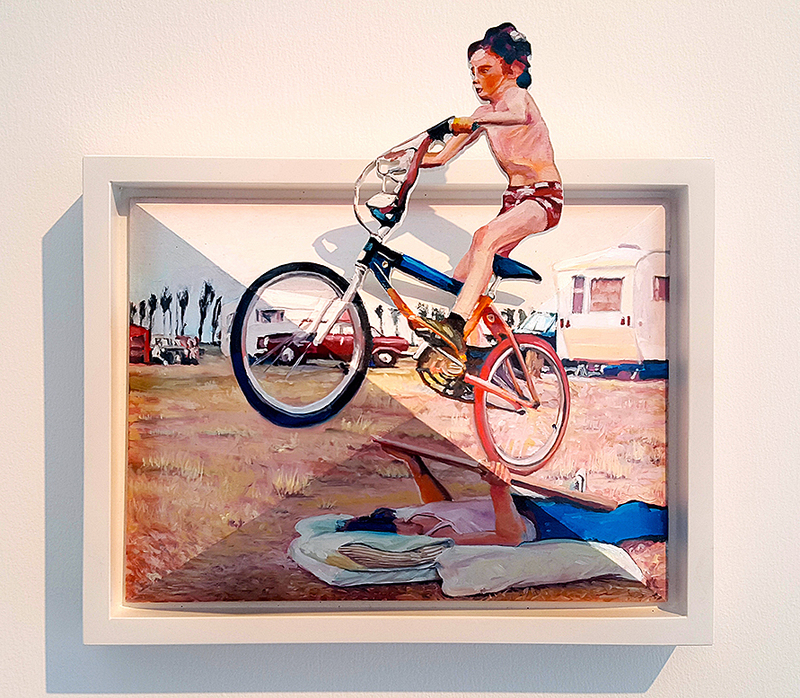 Subjects are often floating—boys jumping their bikes, a girl tumbling midair on a trampoline, a child tossed by his father poised at the apex of a cannonball into a swimming pool—their shadows casting into backgrounds that contain a wealth of funny and specific details (one bike jump is being executed, we realize, off a piece of plywood being supported from underneath by another child). Krieger is masterful with his perspectives and angles, and renders his memories in palettes that move them backwards in time. Tones are generally muted, only to be punctuated by bright blues—the sparkle on electric blue swimming pool, hot blue summer sky, vivid blue jeans on a neighborhood kid in the background. If realism is the mode at hand, one has to wonder, what reality is being revealed? Though the show is titled Pictures of You, it seems clear that what emerges, more than an objective version of reality, is a detailed and highly subjective portrait of the mind of each of these painters. On display are the pictures indexed within the consciousness of their makers; in the end, it makes a picture of them. Which, if any, of these approaches speaks to you probably says a great deal about the snapshots you carry in your own mental wallet. 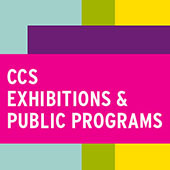 “Calculating with Absence” is installed, and should be viewed, from the roots up. The denser, slightly older works installed in Holding House’s lower level comprise a sort of prima materia which bursts, on the gallery’s main floor, into a constellation of airier, more succinct works that take the viewer on a meditative journey through space, silence, and the evocative, multivalent power of the gesture which stands alone. DeSousa’s early career in architecture is evident in her work- abstract and sharply minimal as it can be, it speaks in the silent, echoing language of space. The more built-up works read like cityscapes, layers of geometric forms and linear gestures crowding the picture plane, built up with industrial surface texture- swirls of resin and caulk. 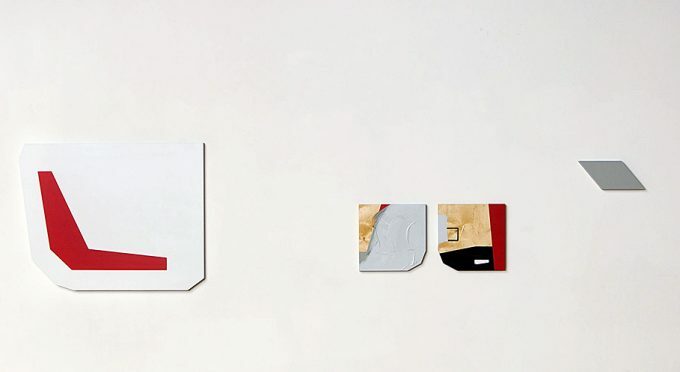 Some of those same textures appear in the quieter works, where they are accompanied by the barest of architectural scribbles, or simply given an unconventional format for a setting- DeSousa’s panels bend, nick off at corners, elongate, and spread along the gallery walls more like evolving visual conversations than self-enclosed paintings. The power of the gesture is uniquely engaged in this format. As immediate as the forms in these paintings feel, their surroundings are carefully considered and have great bearing on how each gesture reads, and moves out into its surrounding space. The cohabitation of DeSousa’s textural swaths with delicate architectural elements suggest both massive scale and confusing layers of space. Seen as forms within pictures, the gestures rupture the quiet recession of space suggested by the drawing, like a sudden realization can rupture a settled sense of reality- conversely, seen in the context of the gallery space, the gestures project from their oddly shaped receptacles to create visual rhymes and dialogs with the surrounding architecture itself. Here is the serendipity of the show’s setting- the exposed beams and raw, plastered edges of Holding House’s interior draws DeSousa’s one-shot gestures out of their pictorial settings, and sets in motion a parallel, but separate dialog with actual space, fostered by the ever-finessing nontraditional formats on which she works. 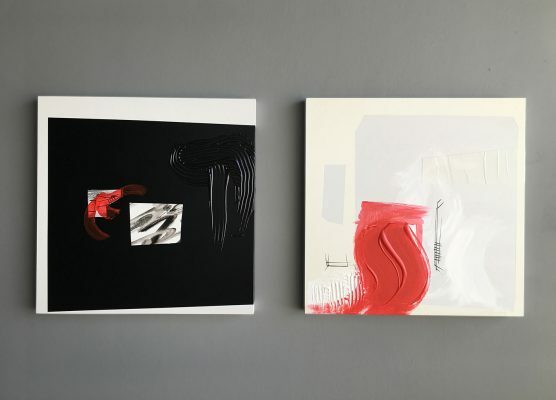 In “Calculating with Absence,” DeSousa has accomplished something very special and rare- two dimensional works that simultaneously dialog with, about, and into three dimensional space while maintaining their own autonomy as beautiful, sharply composed paintings. 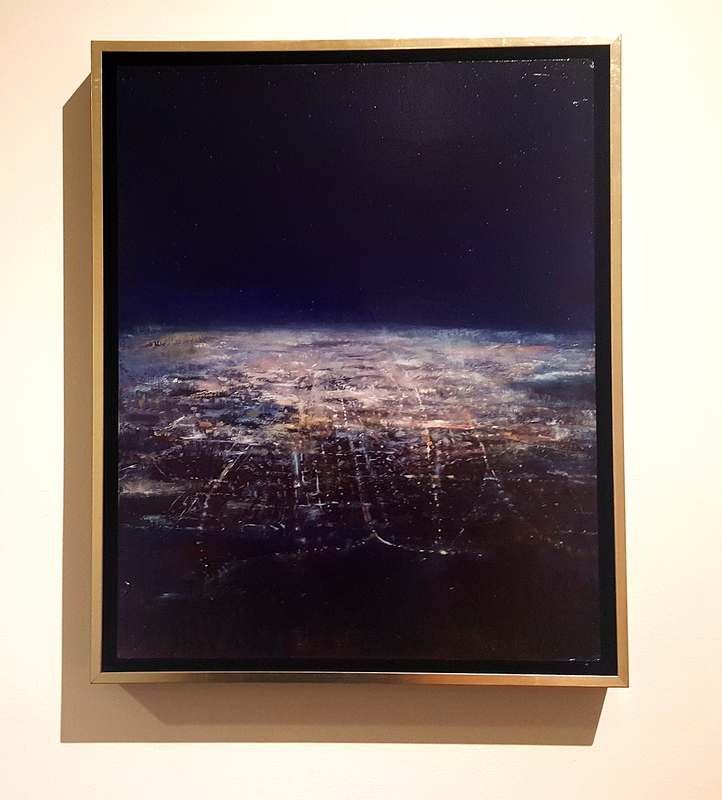 As a long-time fan of her curatorial prowess at Simone DeSousa Gallery (formerly Re:View Contemporary) in Midtown, I guess I shouldn’t be surprised that DeSousa brings as much clarity and power of vision to her studio practice. I sincerely hope we get to see more of this side of DeSousa’s practice in the future. “Calculating with Absence” is on display at Holding House through June 10, 2016. “ECHOES” at Galerie Camille is a three-person show featuring the work of Robert Mirek, John McLaughlin, and Paula Schubatis . The show demonstrates points of resonance that carom throughout the individual bodies of work, as well as creating a kind of visual conversation between the three artists, who would seem to have little in common, at first glance. Mirek and McLaughlin are both established artists with long histories in the Detroit Metro scene. 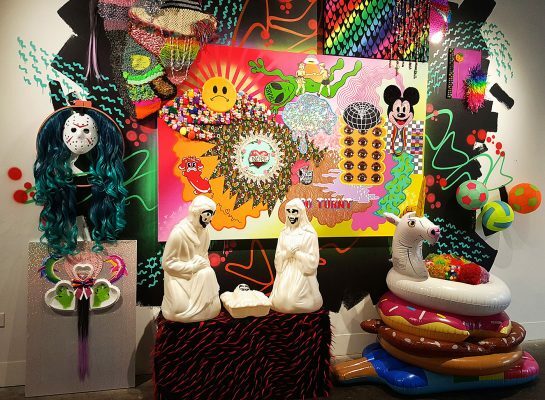 Schubatis is an emerging artist and recent graduate from University of Michigan Stamps School of Art and Design, and has been tearing up the Detroit scene lately, with a turn as a Red Bull House of Art resident, and a number of group and solo shows in the area. Upon entering Gallerie Camille, the viewer is greeted by “Mitosis”—a large-scale wall-hanging sculpture by Mirek, composed of hundreds upon hundreds of tiny wood scraps. 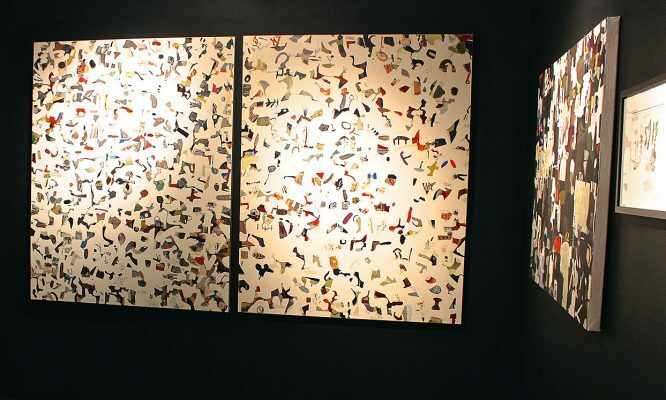 These are the remainders from his labor-intensive series of graphic shape sets, which he designs by computer and then cuts from plywood; two series face off against each other on the walls leading into “Mitosis”: the Strand series on the right, and the newer Thread series on the left. Mirek’s works have a feeling of alien archeology, and the interspersing of his work with that of Schubatis is nearly seamless. 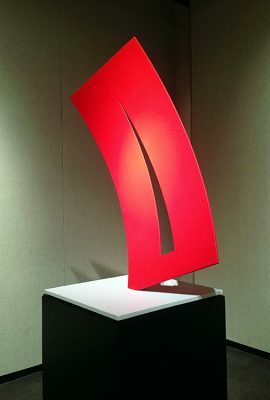 The two artists inadvertently echo each others’ palettes, and her abstract and lovely wall-hangings and humorous rock-based sculptures look right at home alongside his meticulous vocabulary of symbols and oil paintings that veritably leap off the page in their desire to achieve the greater dimensionality accomplished by his sculptural forms. 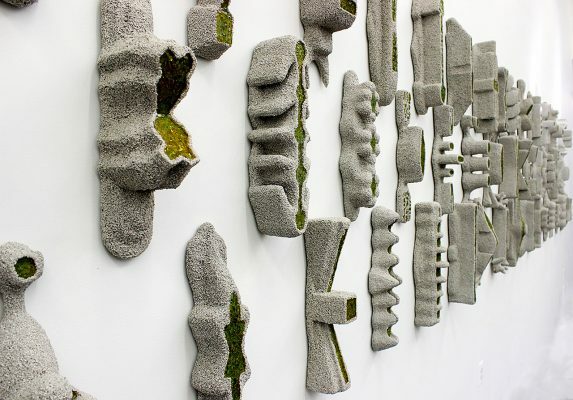 “Mitosis,” with its many constituent parts, is the perfect centerpiece for the show, which features work that seeks to impose order upon a chaos of objects, symbols, and materials. 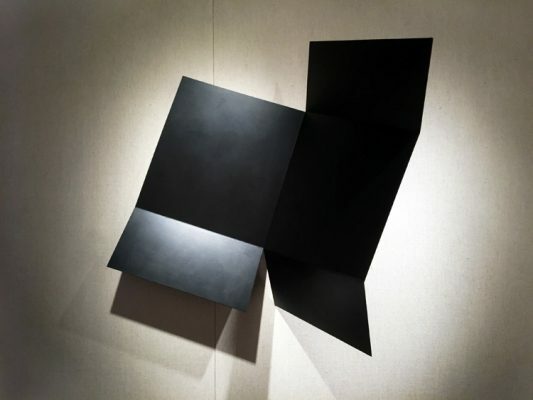 This is evident in McLaughlin’s work, which sits mostly apart from the others, in the deep-set black box gallery. Collage typically implies the layering of images—by contrast, McLaughlin’s mixed media drawings on paper are a colorful motif of stand-alone squiggles, each cut from media materials, which occasionally abut each other, but do not overlap. The effect is something like pouring a colorful jigsaw puzzle out onto a white table; there is a sense of some potential connection or relationship between these shapes, but it is not figurative and not explicit. The whitespace becomes equally as important as the particulates, and the eye caroms around the visual static, looking for imagery—a kind of highly mediated form of cloud-watching. Though his work stands physically and materially apart from Mirek and Schubatis, McLaughlin’s works collectively reinforce the effect created by ECHOES, with swarms of shapes hanging together that effectively echo Mirek’s symbol-clusters in the main gallery. Schubatis has drawn her components into an even tighter matrix—that of the woven body. 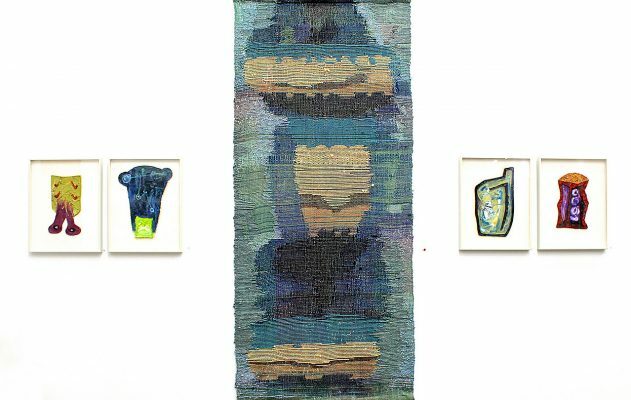 Her weavings have been, at times, highly experimental in her incorporation of odd materials, such as caution tape and other plastic waste, but even in these more conventional wall-hangings, her impeccable sense of balance and bold color choices make for dynamic and achingly lovely compositions. In the center gallery, which is almost entirely work by Schubatis, these are interspersed with sculptural oddities—improvisations on rock forms, embellished with melted candlewax, paint, and bedazzling gemstones. The combination of bold materials, mineral shapes, and paradoxically minimalist finish create a kind of paleo-futuristic effect; these works would be fitting interior decorations for the Starship Enterprise. Or perhaps, again, that influence is seeping through from Mirek’s work, which inescapably suggests alien art: mysterious shapes that beg for translation. The Strand series finishes his plywood forms in an exterior of gray pumice punctuated by sharp chartreuse pebbles of window glass. There is an undersea feel to these, like the superstructure of a reef, the rough irregularity of which has given rise to vibrant life. The Thread series reveals more of the underlying woodwork, and give the sense of architectural models for fabulously modern space-buildings and complexes, with the threads tracing out colorful infrastructure—water lines, green spaces, or transit systems (hovercrafts, one imagines). In the small transitional space between main gallery and the back room dominated by Schubatis, her work and Mirek’s mix almost indiscriminately. Here, a wall hanging is flanked by two of Mirek’s standalone wall sculptures, which tonally mimic each other so perfectly that the truth of that happy accident seems stranger than fiction. There, another woven piece by Schubatis provides a calm striation of undulant yellow-on-gold-on-brown forms, which make a harmonious landscape for several pieces from Mirek’s Scorch, series, which seem almost carved out of bone, with the darker backdrop material revealed, upon closer inspection, to be hundreds of tiny drawn and glued elements—replicating just like cells, alluded to in the title of Mirek’s sprawling centerpiece. Altogether, much to be considered and enjoyed within ECHOES, proving that sometimes the best part of work is the visual echoes that emerge when visions bounce off each other.